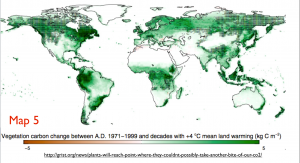 Plants can grow as much as 50 percent faster in concentrations of 1,000 ppm CO2 when compared with ambient conditions, though this assumes no change in climate and no limitation on other nutrients. 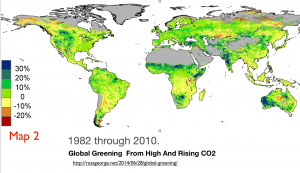 Elevated CO2 levels cause increased growth reflected in the harvestable yield of crops, with wheat, rice and soybean all showing increases in yield of 12–14% under elevated CO2 in FACE experiments. Increased atmospheric CO2 concentrations result in fewer stomata developing on plants which leads to reduced water usage and increased water-use efficiency. Although some writers argue that such global greening means that we need not fear climate change, most specialists take a more cautious stance. At a certain temperature level, any such benefits will be cancelled out. Increasing concentration of carbon dioxide is also linked to ocean acidification, which carries huge dangers of its own. It is also essential to note that not all parts of the world have seen enhanced plant growth. 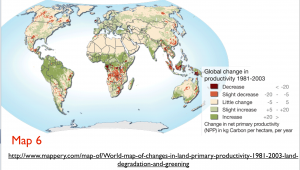 Maps showing changes in primary production over the past several decades indicate that some areas have instead seen significant vegetative decline. 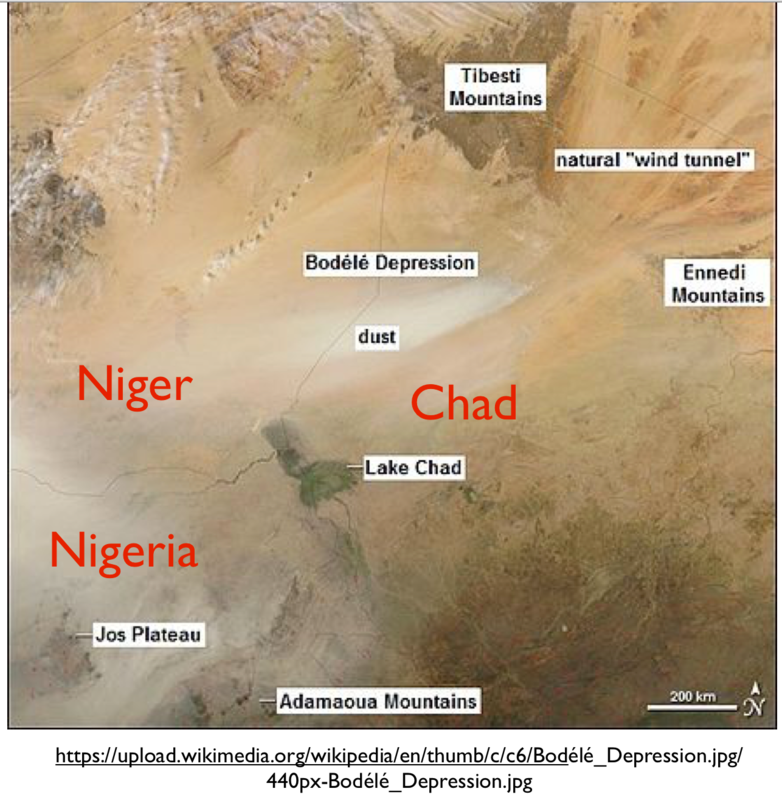 The first map posted here, for example, shows significant “browning” in eastern Mongolia and adjacent parts of northern China, southeastern Australia, much of northwestern India, and especially the Chaco region of Paraguay and Argentina. 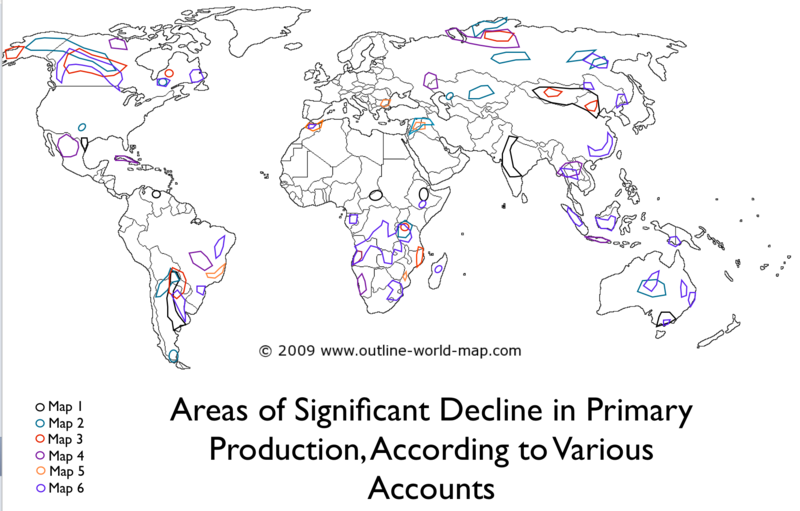 It is not clear why these areas would run counter to the global norm, although drought is a likely culprit. 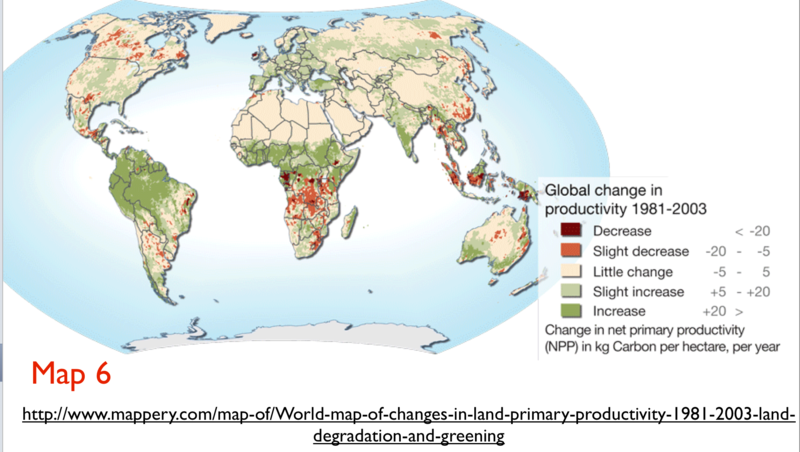 In the Chaco, land clearing for agriculture might seem a possible factor, but other parts of South America that have seen similar land-use transformations are not mapped as having experienced a drop in primary productivity; agriculture, after all, can be quite productive. 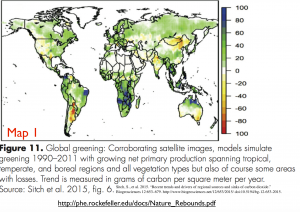 As I have been intrigued by such maps of the “greening Earth” for some time, I decided to run a simple test by comparing a number of such maps to see if they show the same patterns. 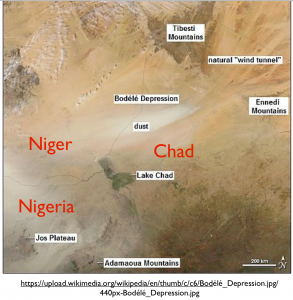 My effort here is highly preliminary and certainly not up to scientific standards: all that I had time to do was locate six such maps by a simple internet search of “greening Earth,” without checking the original sources. These maps are not fully comparable by any means, as they cover slightly different periods of time and are based on somewhat different measurements. But that said, they are still roughly comparably. As it turns out, even the simplest comparison of these maps reveals major inconsistencies. Compare, for example, the depiction of south-central Africa in maps 1 and 6. 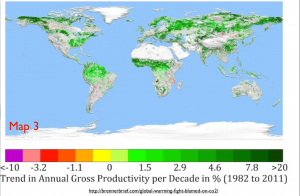 In Map 1, which covers the period from 1990 to 2011, this area is shown as having experienced some of the world’s most intensive greening. 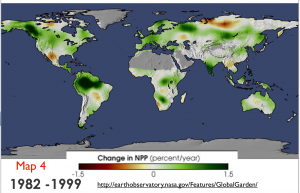 In Map 6, on the other hand, which covers the period from 1980 to 2003, the same areas is shown as having experienced substantial “de-greening.” Hypothetically, the vegetative decline shown in Map 6 could have occurred in the 1980s, while much of the increase shown in Map 1 could have happened after 2003. Such a scenario, however, seems rather unlikely. 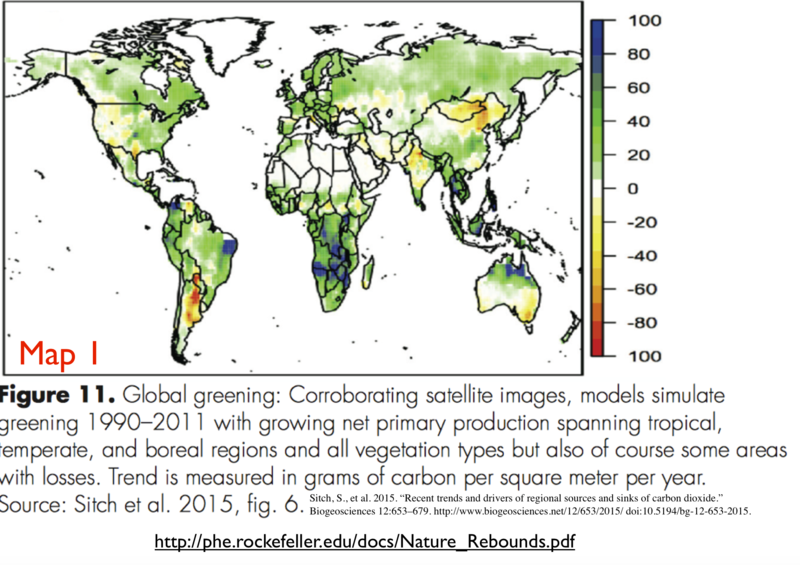 Overall, these six maps depict quite different patterns of greening and browning. 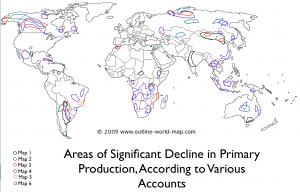 To highlight the inconsistencies, I have crudely indicated all the various areas shown as having experienced primary productivity declines on a single map, color-coding them according to the map on which they are so depicted. As can be seen, substantial overlap occurs in only a few parts of the world. As a result of this little “experiment,” my confidence in the idea that the Earth is generally greening has been shaken. If these measurements are accurate, should not we expect widespread agreement? My own investigation, however, is admittedly crude, conducted over the course of a single afternoon. Perhaps some of these maps are reasonably accurate while others are deeply flawed. Surely further investigation would be warranted.